Police have found cocaine inside breast implants, a wig, a wheelchair cushion, a plaster cast encasing a man’s broken leg as well as inside a 42-piece crockery set. 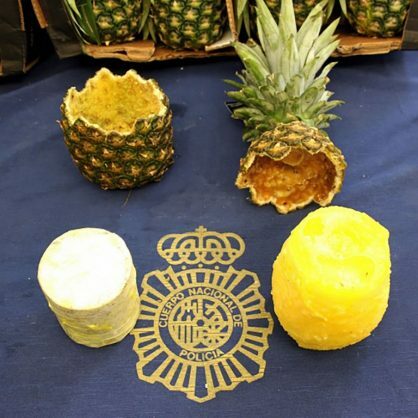 Spanish police said Monday they have seized 67 kilogrammes (148 pounds) of cocaine found inside dozens of hollowed-out pineapples at Madrid’s main wholesale fruit and vegetable market. Each pineapple was “perfectly hallowed out and stuffed with compact cylinders” containing 800-1,000 grammes cocaine and was coated with wax or yellow paraffin to conceal the “odours of the chemical products which the drug contains and avoid its detection”, the statement said. This handout picture released on August 27, 2018 by Spanish National Police, shows a person holding a cocaine-stuffed pineapple, seized by Spanish police in Madrid. Spanish police said on August 27, 2018 they have seized 67 kilos (148 pounds) of cocaine found inside dozens of hollowed-out pineapples at Madrid’s main wholesale fruit and vegetable market. 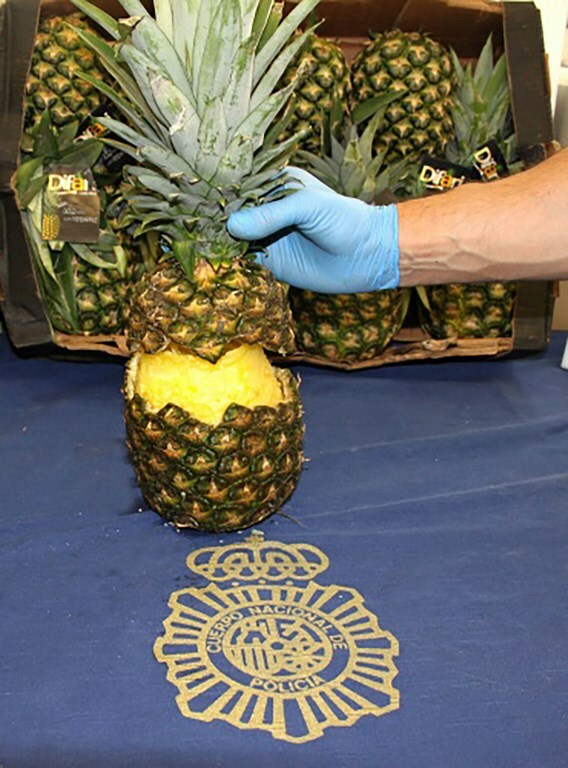 The drug-stuffed fruit was found at the sprawling Mercamadrid market in southern Madrid among a shipment of pineapples that arrived in the Portuguese port of Setubal by ship from Costa Rica and was then transported overland to Madrid, police said in a statement. Picture: AFP PHOTO.